We’d love your help. Let us know what’s wrong with this preview of Monster by Walter Dean Myers. O Sometimes I feel like I have walked into the middle of a movie. Maybe I can make my own movie. The film will be the story of my life. No, not my life, but of this experience. I'll call it what the lady who is the prosecutor called me. Monster. Let me make sure you understand what's going on. Both you and this king character are on trial for felony murder. Felony Murder is as serious as it gets. . . . When you're in court, you sit there and pay attetion. You let the jury know that you think the case is a serious as they do. . . .
You think we're going to win ? It probably depends on what you mean by "win." To ask other readers questions about Monster, please sign up. What did Miss O'Brien see that caused her to look away from Steve after his trial? what do Steve mean: "we lie to ourselves here. maybe we are here because we lie to ourselves"? You may recall several months ago a horrific tragedy befell my family – I LOST MY KINDLE IN MY OWN HOUSE!!!! I did what any sane reader would do and immediately went into meltdown mode and demanded the okay to order a new one (which was promptly given to me because I = psychopath and even the hubs don’t want to mess with me when I’m having a B.F.). After an hour or so I came to my senses (well, as much as is possible) and realized I should be placing the emphasis of the Kindle being lost IN MY OWN HOUSE. I figured as soon as the new one arrived I’d find the old and have to eat serious amounts of crow for eternity. So I did another thing that’s sure to win me my Mother Of The Year Award once again and purloined the youngest’s reader instead (since he pretty much only used it for Minecraft and that is whack). Months went by and then like magic my Kindle fell out from between the slats in the dining room chair where it had managed to wedge itself and remain incognito so long ago and I realized that if both Kindles were attached to my account I could force suggest a buddy read . . . .
You see, the young one is not necessarily a fan of reading, but it does count for a pretty whopping portion of his ELA grade so he is obligated. Last year he proved he was definitely not adopted when he hid in the john for 20 minutes every night like a shady little son-of-a-gun and wasn’t really reading at all. This year I learned from my mistake and had him read a book I had already read (The Absolutely True Diary of a Part Time Indian if you’re curious.) And guess what happened????? He still doesn’t loooooooove to read (and most assuredly stops when his 20 page requirement is over no matter how interesting he finds what’s going on), but he doesn’t moan and groan if presented contemporary realistic fiction. He also likes a low page count and he prefers an unconventional style if we can find it. And allllllllllllllllllllllllll of that ramble is what led us to Monster. Monster is . . . . The main character is Steve Harmon, a 16 year old boy who is on trial for murder of a corner store owner in Harlem. While only being accused of playing “lookout” for the men who actually committed the robbery/ended up shooting the victim, a zero tolerance policy for violent crimes has Steve facing 25 to life just as if he were the one who pulled the trigger. Before getting sent to jail to wait out his trial date, Steve’s favorite hobby was making movies. Therefore, Monster reads like a screenplay and the reader discovers that . . . .
Over the course of 281 pages, you get to decide which category you think Steve belongs in. This was a winner for both the kidlet and myself. A super fast read that easily held the interest of even the not-so-dedicated reader. It also presented quite the resume for itself: Michael L. Printz Award (2000), Coretta Scott King Award for Author Honor (2000), Lincoln Award Nominee (2005), National Book Award Finalist for Young People's Literature (1999), Boston Globe-Horn Book Award Honor for Fiction (1999) which leads me to my one gripe –NOT about the book, but about middle-school teaching/philosophies/beliefs/whatever in general . . . . This book was ON A GIANT BULLETIN BOARD OF “RECOMMENDED READS” in the teacher’s classroom when we went in for Spring Parent/Teacher Conferences. Like Ralphie’s father in A Christmas Story, it won alllll the major awards. My kid read it BASED ON THE TEACHER’S SUGGESTION. And yet it’s not a story that is allowed to be discussed in class. Why the eff not????? Seriously parents, these kids are 12 and 13 years old. Steve Harmon was only 16 in this book when his entire life was potentially going to be snatched away from him. Books like this show the privileged suburbanite a taste of what really goes on in the world. Stop hiding them from your children and stop bitching at teachers that your special snowflake is too precious and delicate to know about the atrocities of modern day American and READ THEM WITH YOUR KID. Then talk about it. Then tell them about real life situations when you hear them on the news. Make sure they know the consequences in order to see that they (hopefully) won’t put themselves at the wrong place at the wrong time. Don’t stick your head in the sand for cripes sake! Nowhere in the book does the pointlessness of what has happened get mentioned. The basic plot is that right before Christmas a drugstore on Malcolm X Boulevard gets robbed. The owner pulls a gun, the gun gets turned on him and he dies. The thieves steal the money in the register and a few cartons of cigarettes, that one of the robbers then sells on the street for five bucks a carton. There are supposedly four people involved in this mastermind heist that I'm guessing nets about $230 (six cartons Nowhere in the book does the pointlessness of what has happened get mentioned. The basic plot is that right before Christmas a drugstore on Malcolm X Boulevard gets robbed. The owner pulls a gun, the gun gets turned on him and he dies. The thieves steal the money in the register and a few cartons of cigarettes, that one of the robbers then sells on the street for five bucks a carton. There are supposedly four people involved in this mastermind heist that I'm guessing nets about $230 (six cartons of smokes at 5 bucks a pop, and a register till usually only has about 200 bucks in it, I can't imagine that drugstore in pre-gentrified 1990's Harlem would have kept more in it at anytime). Split four ways this is about 57 dollars a person and change. This is never mentioned in the book. It's this pointlessness of the whole scheme that struck me as most poignant, that for this pocket change an 'elaborate' conspiracy was created and carried out. Maybe after watching The Wire and reading Clockers the Game being played here seems absurd, like small reward for high risks, that give a stupidity or sheer desperation to the people involved. Maybe it's the ease that the 5-0 make their case based on hearsay, without any kind of physical evidence that makes me feel a little too removed from the story, like this is something that wouldn't happen, but maybe that is just me having my only experiences with criminal trials come from TV Crime Procedurals. Maybe it's the ease that everyone is rolling on everyone else, begging to rat out anyone that they can to get off on some crime that they committed that feels a little strange, like there would be no repercussions in this world for being an open snitch. Again maybe Richard Price is distorting my view of what the world is really like out there. Besides the absurdity of the crime, the other fascinating thing in this book is the unreliability of the story. In at least three spots the truthfulness of what the main character is writing into his movie create tensions that could undermine the whole basis of his story. They are just small things said or done in the story, but they bring into question if anything that happened according to the main character can be trusted at all. Monster is an interesting book in several ways. First, it is written in the format of a movie screenplay interjected with the main character's - a 16-year old African-American boy Steve Harmon's - diary-like entries. I thought I would not like this format, I do not read many plays, but it turned out to be quite the opposite - the format made the story much more dynamic. Steve is on trial for murder (he is accused of being a lookout during a robbery resulting in the death of the store owner), ther Monster is an interesting book in several ways. First, it is written in the format of a movie screenplay interjected with the main character's - a 16-year old African-American boy Steve Harmon's - diary-like entries. I thought I would not like this format, I do not read many plays, but it turned out to be quite the opposite - the format made the story much more dynamic. Steve is on trial for murder (he is accused of being a lookout during a robbery resulting in the death of the store owner), therefore the screenplay unfolds as an intense courtroom drama, where majority of the witnesses are criminals who were at some point cut a deal to testify against Steve and Steve's alleged partner and killer - James King. Second, the story raises a multitude of questions about guilt, peer pressure, racial stereotyping, and flaws of court system. How can you possibly trust the testimonies of criminals, who do so only to reduce their sentences? Is Steve guilty or he just happened to be in a wrong place at a wrong time? If he is innocent, how can a Harlem black boy possibly distance himself from criminals (who he is only acquainted with) in the eyes of the jury? If he is guilty, is his screenplay a way for him to convince himself of his innocence? If he was in a fact a lookout, does it make him a murderer? And does it even matter if he is guilty or innocent if in the eyes of people around him he is a MONSTER regardless of the outcome of the trial? here there be spoilers. just sayin'. So, i lobbied to add this book to my curriculum for 10th grade low levels next year. it's a quick read (although i suspect much less so for them) but it actually presents some very interesting ideas about identity, racism, guilt/innocence, and justice. the kids will all fixate on whether or not they think steve is guilty, which is sort of the crux of the action (he's on trial, suspected of being a "lookout" for a botcohed robbery of a convenience store where o here there be spoilers. just sayin'. So, i lobbied to add this book to my curriculum for 10th grade low levels next year. it's a quick read (although i suspect much less so for them) but it actually presents some very interesting ideas about identity, racism, guilt/innocence, and justice. the kids will all fixate on whether or not they think steve is guilty, which is sort of the crux of the action (he's on trial, suspected of being a "lookout" for a botcohed robbery of a convenience store where one man was murdered). because it's not made expressly clear, the reader essentially has to choose for themselves what they believe and it brings up the question of legal vs. moral innocence (i'm thinking casey anthony would also work as a nice tie in here - can you be found not guilty but still be, in a sense, condemned for what you've done). personally, i think steve is guilty. i think his screenplay attempts to distance himself from not only prison but from the crime itself - he is on the outside looking in on himself and who he was/is. i don't think he ever intended anyone to get hurt, and that's why he desperately looks for some semblance of humanity in himself.i don't think there was any way, however, for walter dean myers to actually find him guilty in a court of law and still have the message work effectively. it would have made the book about the crime, not the person, if that makes ANY sense at all. I chose this book for my Children's Book Challenge- I have never heard of it before, but it has won several awards, including one of the Best Books of the Year in 1999 and was a NYTimes bestseller. This is the story of Steve Harmon, a 16 year old black male who is on trial for a botched robbery/murder. I listened to the audiobook in one sitting; I was so riveted. The flow of the novel was so different, bc Steve is telling the story himself as a movie, and it would appear the text is presented to the reader as a screenplay. It's a short one- 281 pages- but it packs a lot of punch. The best time to cry is at night, when the lights are out and someone is being beaten up and screaming for help. That is the very first line of the book, and it definitely sets the tone. Monster is a few different things. Most noticeably, it's a page-turner written in the unique form of a movie script. But it also analyzes the main character and his choices of morality. Sixteen-year-old Steve Harmon was convicted of being an accomplice in a murder and robbery. Terrified he's going to end up in prison for life or get sentenced to death row, Steve tries to distract himself by keeping track of the events in jail as the case plays out. This was a short, thought-provoking read. It was a powerful punch highlighting an African-American boy's hard life, what it's like to experience prison, and what it means to be guilty or innocent. The ending didn't wrap everything up, which I think is the reason this book didn't get very good ratings. When I first finished it, I too was frustrated with the ambiguous ending that left things a little too open. But the more I thought about it, the more I appreciated the ending. Myers purposely left it open so the reader could decide what had happened on their own. In a way, the reader is supposed to give Steve the verdict: Guilty or not guilty? This was a look at a boy's character who may have got caught up in a terrible crime. I thought it was a great reflection on different kinds of people—the criminals, lawyers, judges, and witnesses were all distinctly developed. This book is AWESOME! I highly recommend this book to people who struggle getting through books. It is a quick read, but a necessary one! "Sometimes I feel like I have walked into the middle of a movie. Maybe I can make my own movie. The film will be the story of my life. No, not my life, but of this experience. I'll call it what the lady who is the prosecutor called me. MONSTER." 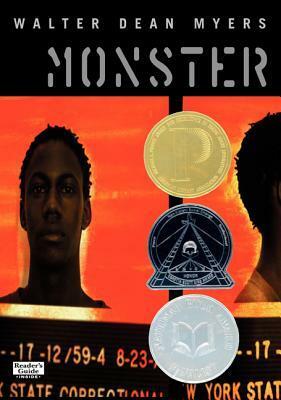 Monster is a hard book to review. While reading it, I could definitely see the appeal and why so many people loved it as much as they did. It's well written, the format is fascinating, and the storyline is the opposite of dull. I can p "Sometimes I feel like I have walked into the middle of a movie. Maybe I can make my own movie. The film will be the story of my life. No, not my life, but of this experience. I'll call it what the lady who is the prosecutor called me. MONSTER." I can practically hear you asking why I didn't give it at least four stars. How does a book with these qualities not receive a glowing review as radiant as it's abundance of stars? Well, the beginning half of the book this was at least a four. But then I finished it and had a startling realization: I did not truly care for anyone in the book. Did I feel horrible for Steve and hope that he didn't have to go to prison? Absolutely. But I didn't care for Steve particularly. I cared for an innocent sixteen year old going to prison for a crime he didn't commit. I don't know what to believe about this story, I don't. I am still trying to figure out if it is a good or bad thing. This book is told through diary entries and as a screenplay by the main character. Yes, it is not the conventional way of doing things, but I thought it a beautiful way to tell the story, even though everything this man writes is gold. This helped, as questions relating to race, dehumanization, relative or subjective nature of the truth and identity began to rise within me (also, I don't know what to believe about this story, I don't. I am still trying to figure out if it is a good or bad thing. 16-year old Steve Harmon is on trial as the lookout man in a Harlem convenience store robbery gone wrong, and the manager is killed with his own gun. The story is told in a unorthodox manner, switching between entries in Steve's diary and an imagined screenplay. Portrayed as a monster, the reader is left to determine his guilt or innocence as a number of troubled youth/criminals testify against Steve. His own worries and thoughts are intertwined as the court case comes to its conclusion. Sixteen-year-old Steve is on trial for murder. But he's having trouble understanding why. "What did I do? I walked into a drugstore to look for some mints, and then I walked out. What was wrong with that? I didn't kill Mr. Nesbitt"(p. 140). Nothing is wrong with that, of course--unless the purpose of that casual trip was to give the "all clear" for a robbery that ended in the murder of the store's owner. Then, something is very wrong. By structuring the book as a movie script being written by the character as he spends his days in prison, faces his jury, prepares with his lawyer, confronts his mother and father, and, most importantly, examines his own life, Myers presents Steve as a talented young man who may have made a single poor choice. However, Myers retains conflict necessary for building a compelling storyline by having Steve refuse to acknowledge his part in Mr. Nesbitt's death. The result is that the reader wants to sympathize with the teen, but cannot help but wonder, if Steve truly does not understand why what he did was wrong, what is going to keep him from going astray in the future? Maybe, as the prosecutor stated, Steve really is a monster. Overall, MONSTER sends an excellent message to young adults: You, and only you, are responsible for the choices you make, and the consequences for those choices may ultimately affect not only the rest of your life, but the lives of the people around you--and maybe those you do not even know. Therefore, think about what you are doing, consider the consequences of your actions, and choose wisely. All the interesting elements within the book are rehashed in the lawyer's closing statements. In it, we're forced to go through every plot point in the book -- except that during these lawyer soliloquies all the events in the book have been condensed into a few sentences. That renders the entire book pointless. This alone could have been a successful short story if Myers had published just that section of the book. King be damned! Cut out the unnecessary; leave the essential! Have we learned any All the interesting elements within the book are rehashed in the lawyer's closing statements. In it, we're forced to go through every plot point in the book -- except that during these lawyer soliloquies all the events in the book have been condensed into a few sentences. That renders the entire book pointless. This alone could have been a successful short story if Myers had published just that section of the book. King be damned! Cut out the unnecessary; leave the essential! Have we learned anything from His wisdom? But of course, it wouldn't have been a YA novel to win awards and accolades. AND THERE WOULDN'T HAVE BEEN THE (view spoiler)[happy cliche expected (hide spoiler)]ENDING. It's important to have black representation in popular literature and YA especially, but to be honest, I don't think that Myers digs deep enough here. Maybe I'm a die-hard cynic, but this still feels a bit cheery, dewey-eyed, and tame. I don't think this does quite enough justice to the experiences of blacks in America. But what do I know. Did you ever wonder what happens after a person gets arrested? Well, I have always wondered what happen to the people that walk to a police precinct with handcuffs. What happen to the people that get sentenced to jail for life. Can a person come out and restore their lives again? How can people get back on their feet? Well, Steve Harmon did. Steve Harmon is a 16 year old African American boy, which is on trial for murder. In this book, you get to go behind the scenes to see what really happens behind those locked bars. He has to stand trail for killing someone in an attempted robbery, which he claims he never did. This is just the beginning of his adventure. Magnificent, that’s the word I would use to describe this book. The book is written differently than any other book I’ve read. It’s like a movie. Walter Dean Myers is a great author, so you are in for a treat. Once I started read this book, I wanted to read more to try to find out what happens next. There seems to be a motivation in this book to make you keep on reading. I really recommend this book if you like something that is unique. I couldn’t stop reading once I started. Mr. Myers has done an excellent job by getting into the mind set of an arrested man and writing this great book. The format was really weird and kind of hard to follow, but the story was okay. Would I have picked up this book without being forced to? No. Was I forced to read this book by my English teacher? Yes. If you like books about trials over a murder crime then you'll like this book. If you like books that repeat the same thing over and over again until you basica Meh. If you like books that repeat the same thing over and over again until you basically know what's going to happen in the next scene, you're REALLY going to like this book. 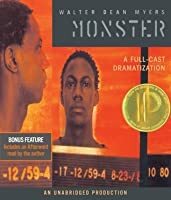 Monster by Walter Dean Myers is a criminal book. I know many people have read this book. for those who haven't read it, it is about a young African American teenager who gets blamed for a crime. A lesson i learned from this book is "Never believe in anyone who seems to be loyal." this leeson means that in any case you really think a person is loyal and is a good friend to you, and who u trust, don't happen to have much trust in them because u know know what they're like until the end. This review has been hidden because it contains spoilers. To view it, click here. General response/reaction: A great book. I love the way it was written in play form with side notes from Steve. It made the read easier and the dialog kept it interesting. The story line was great as well. I was nervous for Steve during the whole book. Characters: Steve Harmon, Kathy O’brien, Sandra Petrocelli, James King, Bobo Evans, Osvaldo Cruz, Lorelle Henry, Mr. and Mrs. Harmon, Jerry, Jose Delgado, George Nipping, Mr General response/reaction: A great book. I love the way it was written in play form with side notes from Steve. It made the read easier and the dialog kept it interesting. The story line was great as well. I was nervous for Steve during the whole book. Plot summary: A boy named Steve Harmon is on trial for murder. He is said to have been the lookout for a group of boys robbing a convenience store and killing the convenience store worker. The story is told from Steve’s point of view in the form of a play and journal entries that Steve wrote while he was in prison and going though trial. He faces a sentence of 25 years in prison to life and even possible the death sentence. The book talks about the experiences he goes through and how jail feels when you are actually inside and not watching it in a movie. The reader finds late in the book that he was actually the lookout for the crime. Steve’s teacher gets on stand and tells the courtroom how he is an honest person and a good student. Steve seems honest to the jury and the book ends with everybody but him being proven guilty. Steve’s lawyer and own parents do not believe that he was innocent but he gets off. Teaching Ideas: After reading this book as a class, you could take the class on a field trip to a real court trial. Afterwards, the students could right a journal entry on the trial and how it made them feel. The book has a unique format; it is written as a movie script. This format gives the reader more blatant clues about setting, and vocal cues (such as subdued, whispering, and showing anger) than would a traditionally formatted novel. There are also variations made in typeface and font that give other cues to the reader. I’m not entirely positive this was all necessary though. The plot is incredibly intense, and a first person narration might have been just as sufficient in telling this story. Ho The book has a unique format; it is written as a movie script. This format gives the reader more blatant clues about setting, and vocal cues (such as subdued, whispering, and showing anger) than would a traditionally formatted novel. There are also variations made in typeface and font that give other cues to the reader. I’m not entirely positive this was all necessary though. The plot is incredibly intense, and a first person narration might have been just as sufficient in telling this story. However, it does offer an element of creativity to the narrator’s character that wouldn’t otherwise be obvious to the reader. I can see that this is a very well written book, and intellectually I know it’s an important topic and a powerful story. I know that a lot of people think this is a terrific book. I just didn’t really like it. The trial, and Steve’s desire to be seen as innocent, and the permanently damage family relationship, gosh, all of that just really got to me. I’m sure that’s a sign of excellent writing…I would not hesitate to recommend it to those looking for an intense book, but for me, I’d rather read something lighter. I think the intensity of the trial, the seriousness of the crime, and the desperation of the main character make me think this would be more suited to older readers, so I would recommend the 15-18-year-old crowd. It might be too difficult for a younger reader to cope with the pressure of the trial and the assumption of Steve’s guilt by his attorney. A younger reader might not be able to understand the long-term affects of the trial on Steve’s life either, and I feel that’s an important part of the story. •The main character Steve Harmon is a 16 year old black man who was arrested for being the lookout in a robbery that turned into a murder. He is now on trial as to whether or not he really was the lookout. Kathy O’Brien is Steve’s attorney who uses a tactic of distancing Steve from the other men in the case as of way of proving him not guilty. James King is the other man on trial he is thought to be the shooter in the murder. Sandra Petrocelli is the district attorney who is trying to prove both James King and Steve Harmon guilty. Richard “Bobo” Evans is another man who is accused of being involved in the murder however he is not on trial. He makes a deal with the prosecution to testify against James King and Steve Harmon in order to get a lighter sentence. Osvaldo Cruz is also a participant in the crime he claims he was a part of it because he was scared of Bobo. •Steve Harmon is on trial for murder the story is written in his point of view and walks us through the trial of Steve Harmon and James King. It also walks us through Steve’s life in prison and how he faces that. During the trial you get to hear about the robbery that turned into a murder and the different witnesses thoughts about it. •The conflict in the story is that the jury needs to find a verdict in the trial and by the end of the story they do. 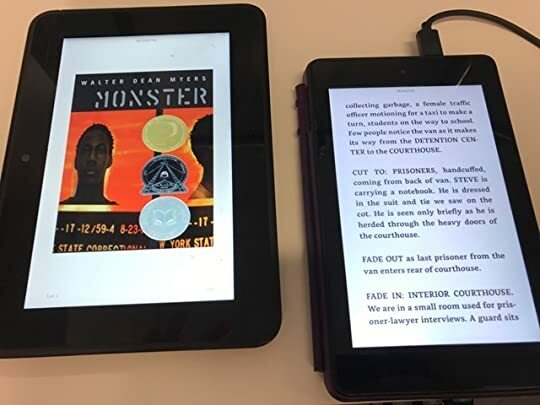 •I liked the book Monster because it was interesting to see the life of a man who is on trial for murder and to see what it's like in the courtroom with all the different witnesses and the attorneys trying to prove people innocent and guilty. Definitely an interesting novel that garners discussion. I can't wait to discuss it at book club! Interesting format but the story did not do much for me. This book had me on the edge of my seat throughout the whole book. I absolutely loved this book. The cover of the book had me liking it from the start. Monster is written like a movie script. this helps because it is less intimidating than most books that go in with more detail. Monster by Walter Dean Myers is truly a Mystery type of book. It is about a African American teenager who gets in trouble with the law. Steve Harmon is looking at Twenty-five years to life in Prison. Steve doesn't know w This book had me on the edge of my seat throughout the whole book. I absolutely loved this book. The cover of the book had me liking it from the start. Monster is written like a movie script. this helps because it is less intimidating than most books that go in with more detail. Monster by Walter Dean Myers is truly a Mystery type of book. It is about a African American teenager who gets in trouble with the law. Steve Harmon is looking at Twenty-five years to life in Prison. Steve doesn't know what to think anymore. He is dealing with the trial he is on and being scared out of his mind with the nastiness that surrounds him in prison . He documents his feelings and experiences that he is faced with.